Layne Lambert provided all the offense his Osceola Astros needed in this July 1992 game, according to The Lakeland Ledger. Osceola beat Winter Haven by a score of 1 to 0. Lambert drove in that run on a double, The Ledger wrote. Lambert knocked in that run in his third season as a pro and in a season where he briefly made AA. He didn't return for a fourth. Lambert never made the majors. 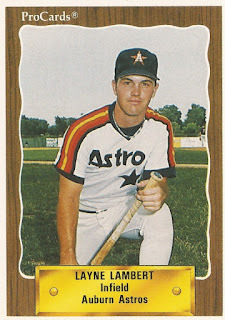 Lambert's career began in 1990, taken by the Astros in the 15th round of the draft out of UNLV. At UNLV, Lambert went 3 for 4 in a March 1989 game. He won second-team All-America honors in 1988. He hit 11 home runs that year and knocked in 53. He started with the Astros at short-season Auburn. He hit .303 there, with four home runs and 37 RBI. He moved to single-A Burlington for 1991, hitting .263 there. Then came 1992. Lambert played between high-A Osceola and AA Jackson. In 71 games at Osceola, Lambert hit .258. He also got 23 games at Jackson. He spent his time at Jackson from June to July. He then returned to Osceola and concluded his career.